This friend of mine got a new keyboard for her computer. It was only $15 at a local box store. Wow. Keyboards must be coming down in price. She was reluctant to just go out and buy a new keyboard as she lives frugally. Striving to be environmentally conscious, she reuses, recycles and repairs what she can, but her keyboard died a few days ago. These days, repairing doesn't make a lot of sense. The cost of labor is often higher than the cost of buying new items. In an average household budget, rent (or mortgage payment) has gotten so high that it far out shadows purchase of new products. If keyboards only cost $15, one can buy 40 of them per month for the cost of renting a $600 apartment. There's not much incentive to save things and do repairs anymore. 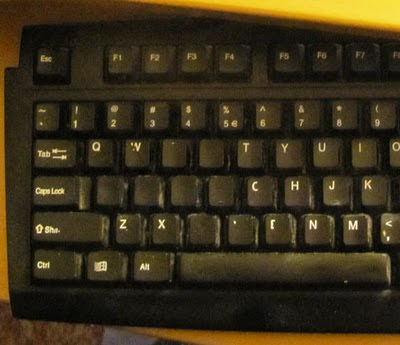 Keyboards usually have a lot of plastic in them. Some folks feel that as oil prices rise, our world, which is largely from of plastics, will crumble. Well, I doubt that's likely to happen. From what I read, plastics only account for less than 7% of the oil consumption. Driving automobiles is a much bigger user of oil. For most people, driving is a large blind spot. They keep driving their cars because they have to get to work, pay their high housing costs and put their kids through college and so forth. In the face of that household picture, $15 for a keyboard is nothing. Since time is often thought of as money, most people don't have the time to fiddle with repairs. My frugal friend, who finally had to break down and buy the new keyboard, does save a lot on oil. Like me, she rides her bike everywhere. That's where the real oil savings comes in. My keyboard has lasted 5 years and it's still going strong. It and the monitor are on their second computer. In 2009, I kept old peripherals when I got a new "box." The monitor is still flat screen. Lettering has worn off some of the keys on my old keyboard so I'm guessing where the Es, Ss, and Cs are. I could do a simple repair job using tiny squares of paper and writing the letters with felt pen. If I do this, I would then tape the letters to the keys with scotch tape. Do I have time for this, or should I just go out and buy a new keyboard? My rent is real low and my job is not very demanding. Maybe I do. Repairs for my friend's keyboard wasn't so easy because the problem was electrical. I hate to toss out this keyboard because all the electrical parts still work fine. I'd feel guilty because it's served me so well and doesn't deserve to be tossed in the trash. I know it's not alive, but it still feels kind of disrespectful to toss something that's working so well. Maybe you don't have time to read all these details as you live in the world of cheap products, high rents, stressful jobs and busy lives. That's what we really need to change if we want to slow down consumption. Back when I was a kid, my mom used to darn socks. Now days, people wouldn't be likely to know what darning socks is. If I remember correctly, my mom fixed holes in a sock by stretching it over some bulbous shaped wooden tool that looked like a spindle. She would then use needle and thread to sew up the hole. That was back when a nice big house could be bought for around $25,000 and only one wage earner could support the whole family on less than $18,000 per year. Today, socks are so much cheaper, relative to other things like housing and health care, that we just buy a packet of 6 tube socks for practically nothing. I don't know if I'd want to go back to the days of darning socks, but having family members spending more time at home, or at play, while spending less time in the workplace seems desirable. When I was a teenager, I had lots of time to play with my radios and fantasies. I didn't have to work in a fast food place. I'm still darning my socks. I did it just a couple of days ago. The color selection of socks has gone down in recent years and they've gone down in quality as well. I hear you on throwing away things that still work.